Get the new Game of Life at Amazon. 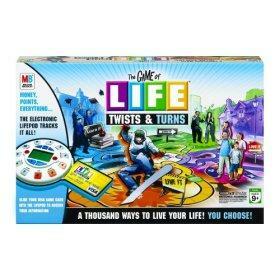 The game of Life Twists and Turns is an updated version of the classic Life board game. Hasbro has updated the game of Life into the twenty-first century. Today, credit cards are a prominent form of payment in every day life. In this new version, there is no cash with every transaction being made with a Visa card. Some critics feel that including the use of a credit card in a game for young children is not a good idea since the game loses basic learning skills like counting money and feeds more commercialism into an already saturated market. On the other side, the view is that the game is simply updated to current everyday life and can be used as a tool to teach kids about money management. The game also includes Visa's notable financial literacy documentation called [www.practicalmoneyskills.com Practical Money Skills for Life], some of which has been adopted into the state governments of West Virginia and Indiana. Replacing the "spinner" that told you the number of spaces you moved is an electronic unit called a "LIFEPod" that keeps track of all player's financial data and pertinent information. During each player's turn, the player's VISA card is inserted into the LIFEpod and the number of spaces the player can move is revealed as well as their standing in the game. Also new in the Game of Life Twists and Turns is how you win. The winner is no longer the one who has the most wealth at the end of the game, but the one that earns the most "life points", which is a combination of life experiences and money. The game board itself has also changed. It is split up into four quadrants called "Learn it", "Live it", "Love it" and "Earn it". This adjustment gives the game a lot more flexibility as the players have the option to move into whatever areas they choose to pursue. Current with the times, players no longer try to fulfill the 1950's version of life and do not have to marry and have children. Players also have the choice of how many "years" (turns) the game will be played and even have a chance at winning the lottery. The game of Life Twists and Turns was just released in August 2007 at a price of $34.99, about $20 dollars higher than the classic version. It is for ages 9 and up, with 2 to six players. Amazon.com - Not just a place for books, get games, music and more. Toys r Us.com - Who doesn't like this store? A fun place to find all your games and latest toys. eBay.com - A great source for games, gadgets and just about anything else you can think of. Life has taken an updated twist into the 21st century. No longer is the game played with paper money and you do not have to be a millionaire to win this new version. Instead, the game of Life Twists and Turns uses a VISA card as the only form of payment, and your goal is to gain life experiences as well as financial security. Will you like it? It depends on your perspective. Whether you think it is too much commercialism for young children or in line with current times, it is an interesting game to check into.